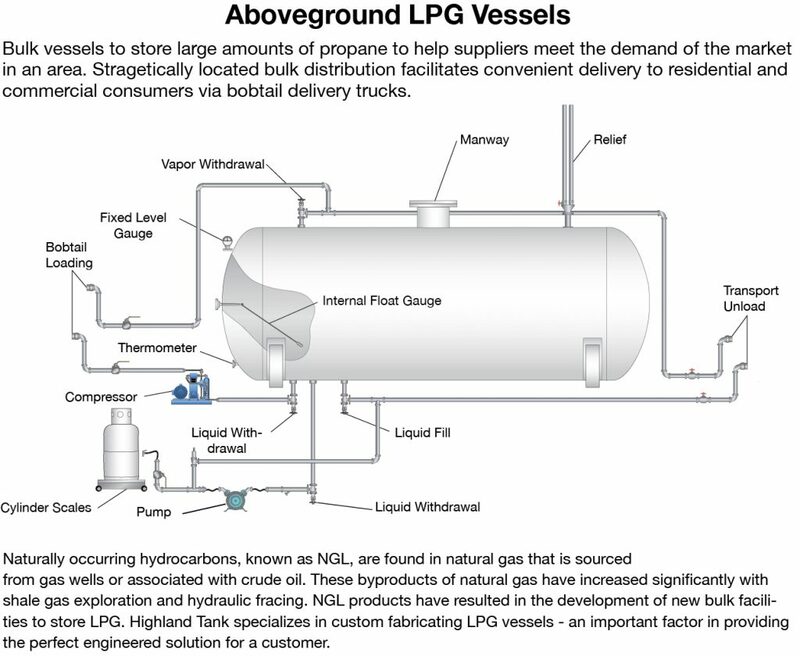 Propane vessels provide fuel storage for a wide range of industrial, commercial, residential, and agricultural applications including: fleet vehicle fueling, indoor lift machinery, farm heating, crop drying, standby electric generation and residential heating, cooling, hot water, ranges, clothes dryers, fireplaces, heat pumps, and swimming pools. Highland Propane tanks are designed, constructed, and registered in accordance with ASME Boiler and Pressure Vessel Code, Section VIII, Division I for compliance with NFPA 58 “Liquefied Petroleum Gas Code” for stationary use in standard and custom sizes from 3,900 to 60,000 gallons. Every vessel is provided lifting lugs that eliminate the need for slings during installation. Highland Tank’s underground propane vessels combine the structural strength of rugged steel construction with the lasting protection of our proprietary coating to produce a propane storage vessel second to none. Many facilities have limited real estate, and the space requirements for aboveground bulk storage vessels are prohibitive. Our underground vessels are offered with a unique cofferdam chamber, which houses piping connections and other tank-top equipment, providing easy access to the working end of the vessel in a strong, safe design. 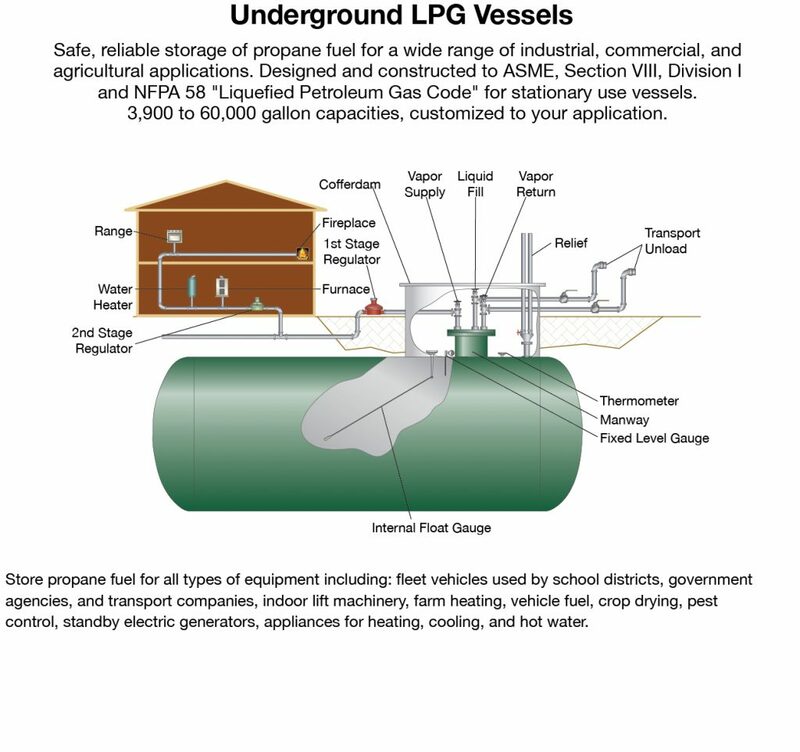 Underground LPG vessels provide added safety in the unlikely case of fire or other natural disaster. Highland Tank is so confident in HighGuard that we stand behind it with a 10-year warranty – a warranty unique to the propane industry. Highland Tank’s aboveground propane vessels utilize ASME 2:1 Elliptical heads, which reduce the vessel length resulting in less real estate for installation than conventional vessels (with Hemispherical Heads) of the same volume. Our experience and craftsmanship combined with rugged steel construction and the lasting protection of durable exterior coatings, produce superior propane storage vessels. Custom fabrication capability unmatched in the industry gets you what you need, when you need it. Highland Tank builds propane autogas vessels used by private, public, institutional, municipal and commercial fleets. 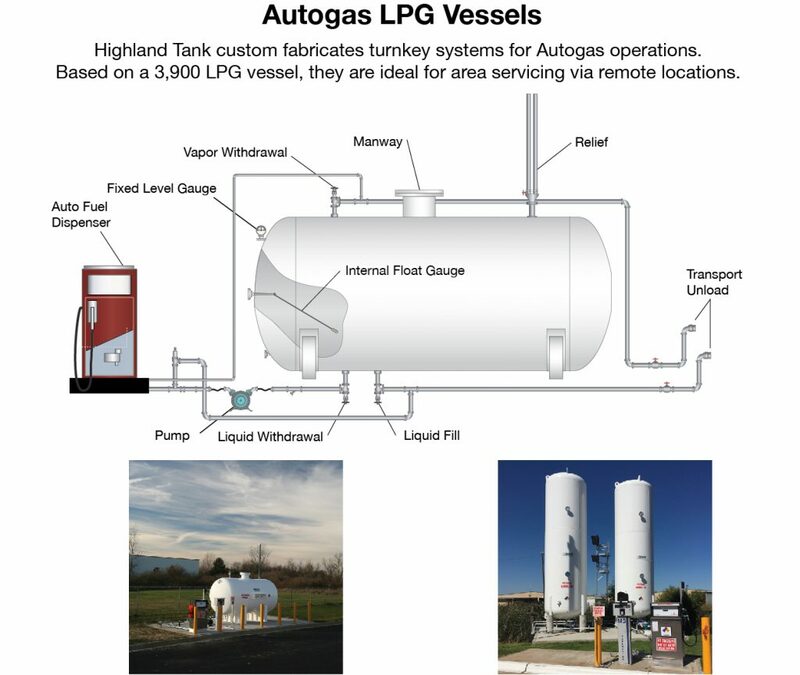 Our engineering team designs complete autogas systems and handles project management, providing turnkey solutions for propane. Standard and custom-built propane autogas tanks in a variety of sizes and configurations are available.